LinkedIn’s shares plunged 19% Friday following weak guidance on its earnings call yesterday. Its revenue forecast for next quarter was $670 million to $675 million, far below analyst expectations of $717.5 million. 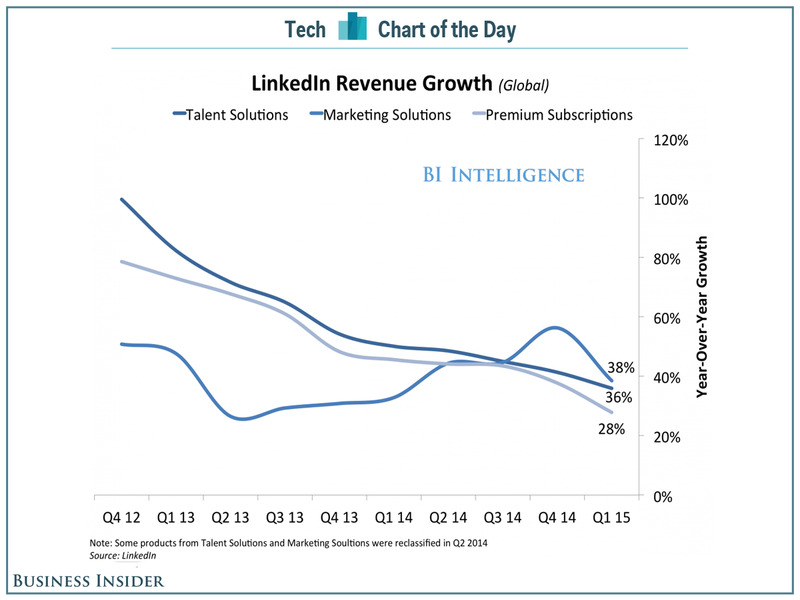 LinkedIn’s revenue has grown almost every quarter, but at a slowing pace. In the first quarter of this year, it had revenue of $638 million, up 35% from last year. But that was a much lower growth rate than previous years: it grew 46% between the first quarters of 2013 and 2014, and 72% between the first quarters of 2012 and 2013. It doesn’t look all that great when you break it down by individual products, either, based on company data charted for us by BI Intelligence. Talent Solutions, the recruiting side of the business, which accounts for more than 60% of its total revenue, grew 36% year-over-year, down from its 50% growth rate in 2014 and 82% in 2013. Premium subscription growth was down almost 20 percentage points from last year, while Marketing Solutions growth was about the same as last year — around 40%.